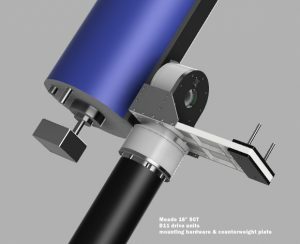 Xerxes Scientific is a new company that was created to offer semi-custom telescope mounts and control systems for astronomical imaging. Their initial products are D11 and D21 direct drive modules which are part of their modular telescope mount system, which can either be incorporated into custom telescope mounts or be provided with mounting hardware in kit form for ready assembly and installation at the customer’s site. Example of a GEM-style equatorial mount made from two D11 drive units, counterweight plate, plus mounting hardware. The D11 Modular Direct Drive System comprises a custom-built high torque direct drive servomotor, precision 26-bit absolute encoder, and CANopen compatible electronic controller. Two D11 modules can be combined to create a custom equatorial, alt-alt, or alt-azimuth telescope mount. These direct drive systems work well for telescope pointing and control as they eliminate backlash as well worm gear adjustment and alignment. Direct drive systems also automatically compensate for disturbances to the telescope such as wind gusts. According to the company, CAN (Controller Area Network) was originally developed by Bosch for use in automobiles but is now the de facto standard for industrial control systems. CAN data buses provide two-way communication between nodes, using an eight-byte message payload, and provides speeds up to 1Mbit/sec. CANopen is an open standard protocol for industrial control systems using the underlying CAN physical and logical layers. CANopen servo drives are widely available and constantly being improved which provides future-proofing to the system designer and customer. Multiple drive axes, sensors, and control end points (such as a hand controller, ST-4 guide port, tilt and temperature sensors) can be attached onto the common bus and the Xerxes Modular Drive system provides a simple cable interface for all equipment, using only four wires. CANopen control technology for telescopes was developed and tested on Xerxes Scientific’s traditional DC servo drive system currently installed at their observatory in Eastern Washington, which carries a Meade 16″ f/10 SCT on a custom offset axis equatorial mount.